For over a decade, the Acadian trio Vishtèn has dazzled audiences with its fiery blend of traditional French songs and original instrumentals that fuse Celtic and Acadian genres with a modern rock sensibility and indie-folk influences. Lauded as “traditional but fiercely up-to-the- moment” (Penguin Eggs), this band from Canada’s east coast has been recognized as an ambassador of Francophone culture around the world. 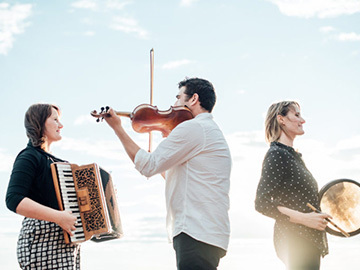 The trio comprises multi-instrumentalists Emmanuelle and Pastelle LeBlanc from the Evangeline Region of Prince Edward Island, and Magdalen Islands’ native, Pascal Miousse. Cradled in the Gulf of Saint Lawrence, in the North Atlantic Ocean, Prince Edward Island is home to a small but thriving a Francophone Acadian community with a rich tradition of song and instrumental music. Nearby, the even smaller archipelago of the Magdalen Islands (les Îles de la Madeleine) is predominantly Francophone, recognized for its distinctive French dialect, songs and unique fiddling style. All three members of Vishtèn were raised in homes in which traditional music, percussive dance and kitchen parties were part of everyday life. Together, they pay homage to their traditions and to the historic and strong musical connections between their two island Acadian communities. Vishtèn Vishtèn is in Moncton, New Brunswick. Vishtèn Vishtèn shared a GRANDS SPECTACLES - CMA 2019. Hier soir on participait au dévoilement de la programmation des grands évènements du Congrès mondial acadien 2019! Ça va brasser en Acadie cet été!! Last night we participated in the program launch for the major events at the World Acadian Congress! It's going to be an amazing time!! Vishtèn Vishtèn shared a post.